AleaModel is a unique type of forecasting model, developed by AleaSoft specifically for energy forecasting, that outperforms classic forecasting models. AleaModel takes advantage of the latest developments in statistics and artificial intelligence in the field of forecasting. It’s a hybrid model approach that combines the power of the artificial neural networks and the efficiency of the Box-Jenkins SARIMA-type model and the multiple regression. In this way, it can take advantage of the benefits of each method and overcome their limitations when used alone. The outcome is an Artificial Neural Network with a SARIMA model structure capable of capturing the seasonal dynamics and evolution of the series that improves the limitations of classical Artificial Neural Networks used in time series forecasting. The use of thresholds and arithmetic transformations in the variables allows the introduction of non-linearities in the multiple variable regression, to determine the influence and correlations between them. 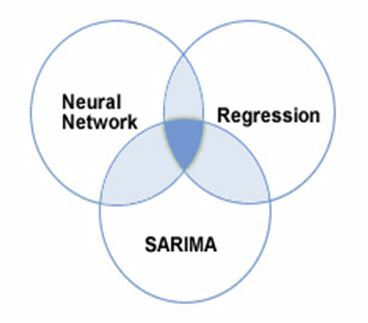 The use of an Artificial Neural Network in AleaModel to dynamically and continuously adjust both the SARIMA and the Regression parameters at once allows it to provide an adaptive scheme capable of reacting immediately to changes in the tendency of the time series and the variables’ influence, changes usually present in real-world data, offering an always up to date forecasting model without the need of periodic manual training.